Insider Monkey finished processing more than 700 13F filings submitted by hedge funds and prominent investors. These filings show these funds’ portfolio positions as of December 31st, 2018. In this article we are going to take a look at smart money sentiment towards Alliant Energy Corporation (NASDAQ:LNT). Is Alliant Energy Corporation (NASDAQ:LNT) a buy right now? Hedge funds are buying. The number of long hedge fund bets inched up by 8 in recent months. 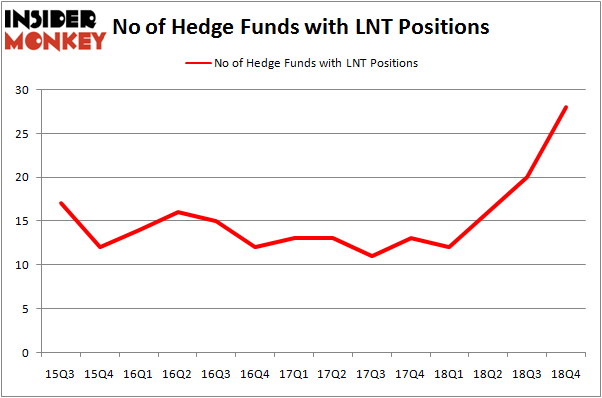 Overall hedge fund sentiment towards LNT is at its all time high. This is usually a bullish indicator. For example hedge fund sentiment in Xilinx Inc. (XLNX) was also at its all time high at the beginning of this year and the stock returned more than 46% in 2.5 months. We observed a similar performance from Progressive Corporation (PGR) which returned 27% and MSCI which returned 29%. Both stocks outperformed the S&P 500 Index by 14 and 16 percentage points respectively. Hedge fund sentiment towards IQVIA Holdings Inc. (IQV), Brookfield Asset Management Inc. (BAM), Atlassian Corporation Plc (TEAM), RCL, MTB, VAR and CRH hit all time highs at the end of December, and all of these stocks returned more than 20% in the first 2.5 months of this year. Let’s view the new hedge fund action encompassing Alliant Energy Corporation (NASDAQ:LNT). How are hedge funds trading Alliant Energy Corporation (NASDAQ:LNT)? At Q4’s end, a total of 28 of the hedge funds tracked by Insider Monkey were bullish on this stock, a change of 40% from the second quarter of 2018. Below, you can check out the change in hedge fund sentiment towards LNT over the last 14 quarters. With hedge funds’ positions undergoing their usual ebb and flow, there exists a select group of noteworthy hedge fund managers who were boosting their stakes meaningfully (or already accumulated large positions). Among these funds, Citadel Investment Group held the most valuable stake in Alliant Energy Corporation (NASDAQ:LNT), which was worth $135 million at the end of the third quarter. On the second spot was Renaissance Technologies which amassed $113.3 million worth of shares. Moreover, Millennium Management, Zimmer Partners, and Carlson Capital were also bullish on Alliant Energy Corporation (NASDAQ:LNT), allocating a large percentage of their portfolios to this stock. As industrywide interest jumped, specific money managers have been driving this bullishness. Zimmer Partners, managed by Stuart J. Zimmer, initiated the largest position in Alliant Energy Corporation (NASDAQ:LNT). Zimmer Partners had $62.1 million invested in the company at the end of the quarter. 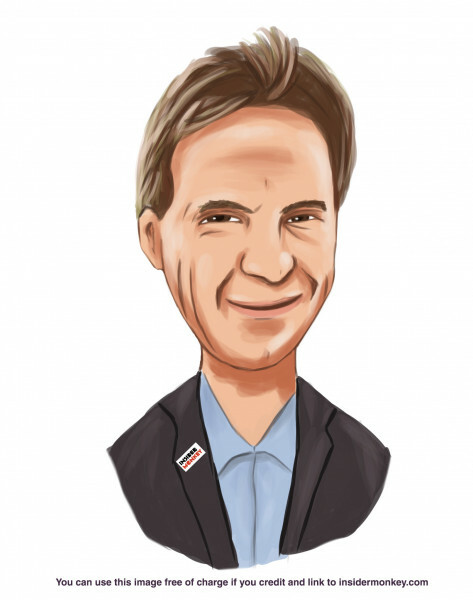 Clint Carlson’s Carlson Capital also made a $42.9 million investment in the stock during the quarter. The following funds were also among the new LNT investors: Jonathan Barrett and Paul Segal’s Luminus Management, Steve Pattyn’s Yaupon Capital, and Michael Gelband’s ExodusPoint Capital. Let’s now review hedge fund activity in other stocks – not necessarily in the same industry as Alliant Energy Corporation (NASDAQ:LNT) but similarly valued. We will take a look at Apache Corporation (NYSE:APA), FMC Corporation (NYSE:FMC), Akamai Technologies, Inc. (NASDAQ:AKAM), and Regency Centers Corp (NASDAQ:REG). All of these stocks’ market caps match LNT’s market cap. As you can see these stocks had an average of 27.5 hedge funds with bullish positions and the average amount invested in these stocks was $764 million. That figure was $604 million in LNT’s case. Akamai Technologies, Inc. (NASDAQ:AKAM) is the most popular stock in this table. On the other hand Regency Centers Corp (NASDAQ:REG) is the least popular one with only 15 bullish hedge fund positions. Alliant Energy Corporation (NASDAQ:LNT) is not the most popular stock in this group but hedge fund interest is still above average. This is a slightly positive signal but we’d rather spend our time researching stocks that hedge funds are piling on. Our calculations showed that top 15 most popular stocks among hedge funds returned 19.7% through March 15th and outperformed the S&P 500 ETF (SPY) by 6.6 percentage points. Hedge funds were also right about betting on LNT, though not to the same extent, as the stock returned 13.1% and outperformed the market as well.